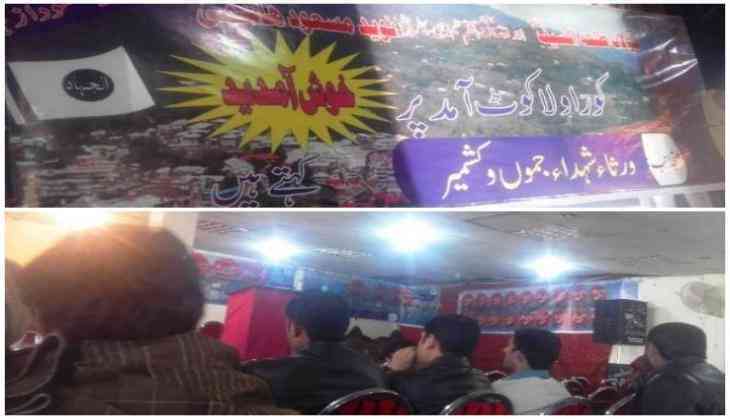 The Jaish-e-Mohammed, a group founded by UN-designated terrorist Masood Azhar, recently organised a 'Shohada-e-Kashmir' conference in Rawalakot to commemorate the martyrdom of several terrorists killed in Jammu and Kashmir's Pulwama. Three militants of JeM - identified as Talha Rasheed (nephew of Maulana Masood Azhar), Bhai Mohammad and Bilal - were killed in the encounter by the Indian security forces on November 6 in Pulwama. The secret conclave was attended by Maulana Talha Saif, younger brother of Maulana Masood Azhar, Maulana Mufti Asghar Khan, Amir JeM, PoK, Mukhtar, father of Bhai Muhammad, one of the killed militants, and many others. Over a thousand JeM cadres attended the event in which slogans against India and the United States were raised. Challenging the democratic countries, including India and the United States, Maulana Talha Saif, in his speech, said, "If someone wants that 'Fidayeen missions' must stop their attacks then they must stand in front of them like both hands folded." A senior JeM functionary Saifullah Akhtar, in his speech, said, "JeM cadres will not forget their martyrdom and will continue their mission till it gets completed." Mukhtar, father of Bhai Muhammad, one of the killed militants, said, "We have been waging a war since for the past 28 years and still asking we had got nothing. But, if you ask from those who are ready to sacrifice their lives for Kashmir then they will tell you that their shedding of blood in Kashmir will not go in vain but it becomes more fruitful. They are doing Jehad for Kashmir but doing it for Allah." Naveed Masood Hashmi, a senior JeM functionary from Islamabad, accused Nawaz Sharif for acting against JeM. He said, "Mauland Masood Azhar had prepared hundreds of JeM cadres and sent them Kashmir for the protection of Kashmiri brothers and sisters. But, Nawaz Sharif wanted to arrest them in Punjab." He added, "Who is enemy of Islam - Nawaz Sharif or Maulana Masood Azhar? Nawaz Sharif is the enemy of Islam and that's why we are not getting victory in Kashmir. Kashmir will get liberated only after pro-Islamic government is established in Pakistan." Such gatherings in support of terrorists killed in Jammu and Kashmir authenticate the Pakistan-based terror outfits to be behind terror activities in India, especially J-K. This also affirms the fact that Pakistan-based terror outfits not only use the PoK territory for `jihad' against India, but also organise conferences to emotionally exploit the locals for proxy wars.